Industry leader XFX has added a new dimension to gaming with its XFX AMD Radeon HD 6870 and HD 6850 graphics cards. This latest series of AMD Radeon graphics cards is AMD’s first introduction of a 3-D gaming and multi-media solution for desktop computers, plus one of the first HDMI 1.4a and DisplayPort 1.2 solutions for Stereoscopic 3-D on the market. This advance into Stereoscopic 3-D ushers in a new era of gaming that takes it to the next level. With up to 120 Hz active shutter technology, the quality of 3-D achievable with the AMD Radeon HD 6870 and HD 6850 is unprecedented in comparison to previous 3-D solutions created by other manufacturers. The AMD 3-D experience is truly immersive and seamless. 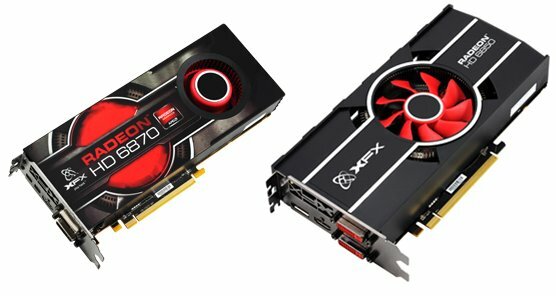 These standards help make AMD Radeon solutions more readily compatible with a broader range of choices for building a computer with a stereo 3-D solution including hardware, software, middleware, glasses as well as displays. XFX AMD Radeon HD 6870 and HD 6850 graphics cards kick down the doors into a new realm of gaming as the second generation of DirectX 11-capable graphics cards. 1 GB DDR5 ram is filling enough for even the most hungry gamer and the core speed (775 MHz in the HD 6850, 900 MHz in the HD 6870) can keep up even in the most intense of gaming scenarios. Shaders at speeds of up to 800 in the HD 6850 and 960 in the HD 6870, ensure that graphics are consistent, crisp and life-like. The chipset is based on the previous dual engine architecture, but it’s been revamped for improved gaming action. With the new series XFX debuts the XFX 3E Technology, a new trilogy that incorporates AMD Eye-Definition, AMD Eyefinity and AMD EyeSpeed. AMD Eye-Definition, which utilizes AMD’s HD3D technology, supports rich, life-like visuals and offers explosive HD gaming performance. These high-powered cards feature exclusive AMD Eyefinity multi-display technology that expands the view of the gaming landscape for the ultimate immersive entertainment. AMD EyeSpeed Visual Acceleration Technology improves video image quality and application performance for crisp, incredible video, 3-D photos and Blu-ray 3-D. This cutting edge technology also accelerates video formats like DiVX and DivX Plus HD and features improved performance with applications like Microsoft Office 2010, Internet Explorer 9 and Mozilla Firefox 4. Enrich your online video and Blu-ray 3-D viewing experience with unrivaled, smooth performance and stunning visuals. The AMD Radeon HD 6870 and HD 6850 graphics cards are 3-D ready and offer no-compromise performance with a flawless image quality for even the most demanding games. AMD’s HD3D technology fully supports Stereoscopic 3-D gaming, so users aren’t just playing the game – they’re in it.